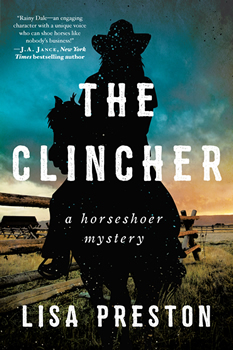 Lisa Preston’s latest novel, THE CLINCHER, features Rainy Dale, a spirited and outspoken farrier (horseshoer) with a troubled past. This first in the Horseshoer Mystery Series is a fast-paced, exciting ride alongside Rainy as she investigates the murder of her trophy-wife client in rural Oregon. The Big Thrill recently had the opportunity to talk with Preston about the first in a new series, THE CLINCHER. Congratulations on your new mystery series debut, THE CLINCHER. Your main character, Rainy Dale, is a horseshoer—an interesting and original occupation for an amateur sleuth. Why horseshoeing? After a couple of standalone thriller and suspense novels, I was interested in doing a series. I wanted to accomplish two things at the outset: create a character with plenty of room to grow, and build a mystery series world that hadn’t already been done. A horseshoer accesses properties of all kinds, yet can go largely unnoticed or ignored by others while working for an hour or a day on someone else’s premises. Part of the shoer’s skillset is observation. The same mind that notices subtle changes in one hoof on one horse can notice a wound, friction between people, a car or tool out of place—and these things can be clues to a crime. No spoilers, but how has Rainy’s past influenced the person she is today? There are hints about that main subplot in the first pages, then sprinkled throughout until the bomb is dropped. She doesn’t quite realize that what haunts her isn’t so much that one thing she did, but that she doesn’t allow herself to get close enough to the man who loves her to share this painful piece of her past. Being stuck in that way makes her a bit of a jerk until she can fully reveal herself, risking vulnerability. You were born in Arizona, traveled extensively through the Western United States, South America, Europe, and Asia, and now you live in Washington. Your travels have taken you to scenic places where nature can be as treacherous as it is beautiful. THE CLINCHER takes place in a small town in Oregon. Given your background and interest in the outdoors, how important is setting to your novels? 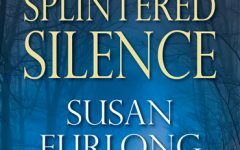 Setting probably doesn’t quite rise to the level of being a character in this mystery series, but it’s thoroughly present, anchoring many scenes. Those non-visual sensory details bring the reader into THE CLINCHER’S world, let them feel the slip of mud under the boots, smell the evergreens, taste the Gruyère crust on the savory pie her fella offers for dinner, wince from the ground-shaking whoosh of the passing freight train—as anyone who has ridden Amtrak’s usually late Coast Starlight through central Oregon can tell you, freight has priority over passenger trains in the West. Like Rainy, I live in a remote area, thus deal with unreliable cell service, a problem that can hamper communication out here. In this series, nature’s impacts are often found in ways that city people don’t generally experience, but rural folk might take as a given: loose sheep or cattle on a road because a fence goes down in a storm, a transplanted stock-dog returning itself to a former ranch, a horse with a catastrophic injury managing the stunt in the middle of the night during terrible weather. You have a fascinating background—one well-suited to writing crime fiction. Please tell us a little about your career history and your journey to publication. Careers as a fire department paramedic and a city cop—the latter having included detective assignments in Vice and CACU, the specialty Hostage Negotiation team—then promotion to sergeant and internal affairs, certainly showed me extreme situations. I’ve held the hand of a little old lady whose adult grandson had just committed suicide in front of her. I’ve agreed to talk a guy to the right spot for our sniper to get a shot at him. I’m awed by one of my officers talking a woman three stories up in a burning building into dropping her baby out of the window; he swore he’d catch it and he did, then he talked her through a series of jumps that resulted in her only breaking a leg. It’s endless and all those situations were preceded by warnings signs, choices, decision points. People and their choices fascinate me. Since childhood, I’ve been a reader and writer, morphing stories, developing ideas into something larger, trying to make sense of situations. I broke into publishing via years of hard work and hundreds of cold queries. In addition to writing mysteries, you also write nonfiction and psychological suspense. 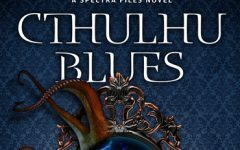 What are the challenges of writing in multiple genres? Do you find writing in one genre or subgenre inspires ideas for books in another genre? I definitely find inspiration across fiction genres. The standalone psychological suspense and thrillers were an utter delight—stories of the heart that I wanted to share. The reader response has been gratifying. My nonfiction has been fairly niche—books on dog and horse care and training—but I’ve done short fiction (see the 2019 Malice Domestic anthology, Murder Most Edible) that I find a wonderful recharge. I like writing tight yet still bringing plenty for the reader to think about and experience. What advice do you have for authors who are just starting out? Write. Read. Rewrite—it’s where most aspiring writers do not work nearly hard enough. And then repeat. Just keep going—it’s how you finish an ultramarathon or a 100-mile ride, summit Kilimanjaro, or write a novel strong enough to get published. You keep going. Keep studying the craft. Keep paying attention to good writers. Keep writing and rewriting. It depends a bit on where I’m at in the publishing schedule—producing new work, rewriting, completing short pieces for various outlets, responding to the Quotidien administrative stuff that comes with the job. Mornings are best, I’m sharper and eager to be released to the outdoors, especially in good weather, so I want to clear my desk if possible. What do you love to do when you’re not writing? Enjoy my family at home. We live on acreage within an easy run or ride to a vast tract of public land comprised of the Olympic National Forest, Olympic National Park, and state lands. I love to horse ride, run, or hike that backcountry. We have terrific lake swimming spring through fall here, too. Indoors, of course I love to read. Do you have a favorite spot from which to write? What’s next for you, Lisa? THE CLINCHER is a multi-book deal, with each novel carrying the first chapter of the next book in the back. Beyond this series, we’ll see. My agent and I are considering a couple of different options and I need to make some choices. The next year or two are bringing some exciting prospects that’s under wraps until the deal is ready for announcement. 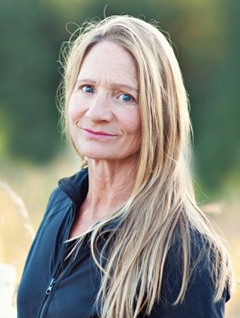 Wendy Tyson is a writer, lawyer, and former therapist whose background has inspired her mysteries and thrillers. Wendy writes two mystery series, the bestselling Greenhouse Mystery Series and the popular Allison Campbell Mystery Series. Wendy’s short stories have appeared in literary journals, and she has short fiction in two anthologies, Betrayed and the forthcoming The Night of the Flood. Wendy and her family live in Vermont.